At this point, you can have just about any kind of food delivered to your doorstep or desk. You can even have beer delivered with your next pizza order. Strangely enough, the thing many people pick up over and over throughout the day is not quite as easy to have delivered to the office for your midday pick-me-up. But that's going to change because you can now have Starbucks coffee delivered to you. Starting January 22, Starbucks will offer delivery through Uber Eats, according to the companies. 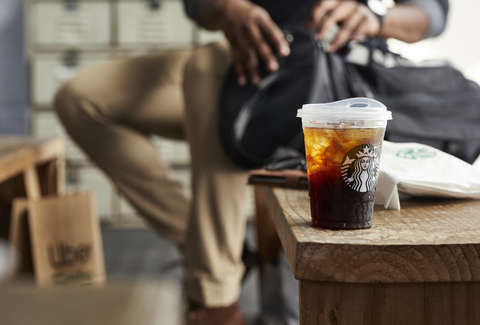 Whether you're looking for nothing but a small coffee or you go all-in with your grande cold foam cascara nitro cold brew with a pump of vanilla, it can be brought to your desk or couch, presumably with your name misspelled on the side of the cup. The service will start in San Francisco on January 22, then roll out to Los Angeles, Chicago, Boston, Washington, DC, and New York City over the next few months. (That's the order the cities were listed in the announcement, but a Starbucks representative has confirmed that that's not necessarily the order in which delivery will be rolled out.) Do to everything that goes into delivery, the menu will be slightly limited, but it looks like you can still order just about any drink you'd order in-store. However, it's not clear if you'll be able to redeem Starbucks Rewards perks like the occasional Starbucks Happy Hour promotion through Uber Eats. What is clear is that if you hate the sludge your boss brews in the office and would prefer a mocha, things are coming up Milhouse.